It takes a synchronized lock and dam system — operating like a motorized flight of stairs on the Illinois River, using gravity to move the water — to maintain a minimum depth for boat traffic. 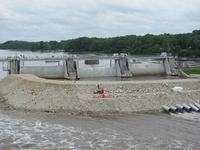 A disastrous domino effect occurred on 19 April 2013, when heavy rain and runoff, strong winds, and river currents resulted in seven unmoored barges crashing into the dam at Marseilles, Illinois. Researchers say that the system of locks and dams on the Illinois River is vulnerable to changing climate and weather extremes. These more frequent and unpredictable conditions can cause shipping accidents, damage to lock and dam systems, streambank erosion, shipping accidents, and local flooding. We are all familiar with the power of electromagnetic attacks from the movies: in “Ocean’s Eleven,” George Clooney’s gang disables Las Vegas’ power grid, and Keanu Reeves’ henchmen hold off the enemy robot fighters from their spaceship in the “Matrix Trilogy.” The heroes in the films succeed by sending out a very strong electromagnetic pulse, which changes the voltage in the vicinity so that regulators, switches, and circuit boards in electronic equipment go crazy. Researchers are now trying to figure out how such attacks can be detected. They have developed a measurement instrument for this purpose that is capable of determining the strength, frequency, and direction of electromagnetic attacks.